Sofie Rosenberg is the Protect Our Breasts Science Director responsible for translating new research on concerning chemicals from endocrine disruptors to mammary gland carcinogens for our audiences. Sofie also works in the laboratory of biology professor and POB Science Advisor, R. Thomas Zoeller. 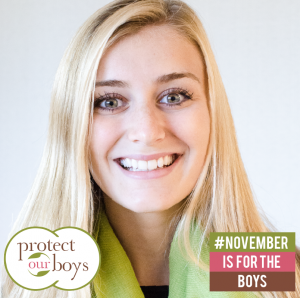 This November, the focus is on the boys, for the annual Protect Our Boys campaign. We will be focusing on Testicular Dysgenesis Syndrome (TDS) and the reduction of sperm motility, mobility, and quantity that can be associated with environmental toxins. Testicular Dysgenesis Syndrome includes three main symptoms; testicular cancer, cryptorchidism (undescended testes), and hypospadias (abnormal urethral opening). While some individuals may have all three symptoms, others may only experience one or two. The science indicates that males’ exposure in utero can increase their risk of TDS, therefore making it important for mothers to avoid harmful endocrine disrupting chemicals, particularly antiandrogenic chemicals to protect their future sons. Research has also shown the link between men’s exposure to phthalates and reduced sperm motility, mobility, and quantity. Sperm health is essential for reproduction to occur, and a recent study shares that there has been a 59% decrease in sperm count over the past forty years (CNN/NPR July 2017). This means that the number of sperm males produce is being greatly reduced and this could eventually have an impact on overall reproduction. Men should avoid chemicals, like phthalates, to protect their sperm.